It's been a few days since I stepped off the flight from Texas; a few days back at work, trying to somehow organize the thoughts, memories and perfect words to describe what has been an experience worthy of being speechless. Music and a cold Summer Ale are my catalyst ingredients for putting together the first blog post since I left bike racing in 2011 to start my family. This will be far from a complete report, but hopefully I can give a glimpse into what was an event to remember. First and foremost, this opportunity came thanks to an amazing organization that I have become involved with, Team 4Mil. Go to the website and check it out. Our Mission is to support combat wounded and their families and their rehabilitation through the sport of cycling; providing both recreational and competitive opportunities for them to ride. I learned about this organization back when I used to coach some (no longer) wee ones in spin class a few years ago...and their Dads were doing this crazy race called RAAM. The next year, Brian and I brought them on as a charity for the Bike Doctor St. Michaels Century. Last year, we combined it with adding in Bob Roll. After that (and seeing two AMAZING warriors, Tim and Will, finish the 100+ miles of the century....one using one arm and the other using one leg), I was hooked. I Want To Do More was all I could come up with in my email to their president. And the rest, we shall say, is history. Fast forward to early May 2013. I think Wayne's exact words were, "Are you sitting down? I'm going to ask you something and I need you to try not to pee yourself." 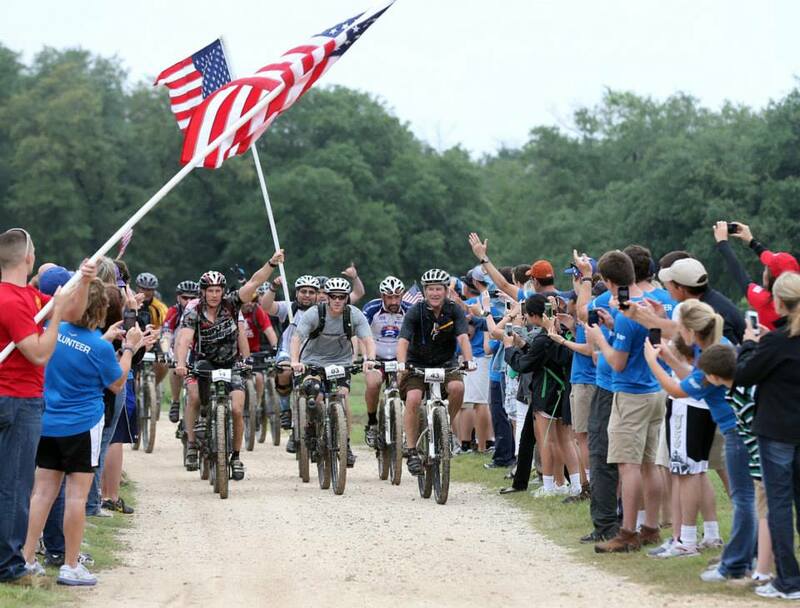 Would I go to Texas to represent Team 4Mil and ride mountain bikes with the former President of the United States? Was that even a question that had any answer other than, "hells yah!"? I was stoked. But it meant 5 days away from the family, and I have to thank my husband up front for taking on the single parent role, giving up some important days of riding himself, and giving me the opportunity to do this. These opportunities come once, if at all....and I'm so thankful to have someone in my life who is a cheerleader for my happiness like he is. Thank you, Brian! And then I found out I was going to get to experience this event with two people who I'd barely met, but couldn't have been more excited to team up with. Jeff Palenske, a Warrior racer with Team 4Mil and Adrien Thom, a stud triathlete and former Marine bad-a$s, would meet me in Waco. First major trip to Texas, first major trip away from the family since Seb was born, first time spending time with a former POTUS; you know....the typical firsts. Preparation details are boring. Let's move right along to TEXAS. Ady picks me up in Waco in what would be our chariot for the week. It doesn't get more Texas than riding around in a White Chevy Pick Up. I could already tell this was going to be an AWESOME week. We get to the hotel, check in with the Bush Center staff and get our bikes ready to deliver to the ranch. Driving out to Crawford for the first time, I remember being struck by the massiveness of the landscape. The horizon felt a million miles away. And it was beautiful. We approach the President's Ranch and it's pretty obvious we're not in Kansas any more. We're instructed to rack our bikes on the helipad (because really....where else would you set up a bike rack?) and off we go. Day one closes with grocery shopping and dinner at the hotel. We have no idea what to expect for the next few days, but for Ady and I, it's GAME ON! So the entire event is supposed to cover 100K in three days which, for roadies, may not seem like much distance. On a mountain bike, however, it's some significant riding. Especially when the longest ride I have ever done on an mtb might be around 25 miles. I told myself well before we start that this was going to happen in one of two ways: I was going to either limp through the 100K, falling a lot and probably hurting myself, OR, I was going to surprise myself and realize that I love riding a mountain bike for a reason....and that I could really do this. And when in Texas, Cowboy Up, right? Back on the ranch, we prepped our bikes and ourselves for the first leg of the event. It was hard not to gawk when G.W.B. himself stepped out of his red off-road Gator and started to make his way over to us. Wait...he's walking towards US. I hadn't even prepared myself for what to say to him. But there he was, shaking our hands and acting like another mountain biker, excited about the weather, the event, and looking forward to tearing up the trails. It was one of MANY times that Ady and I would look at each other and just explode, "NO WAY!" All 3 members of the Team 4Mil contingent located over the President's right shoulder. There were 75 of us there to ride with the President, including the 14 honoree Warriors, Secret Service, former ride participants, and other support riders. Team 4Mil was being honored for its service to the combat wounded community, and Ady and I were given special, former-Presidential permission to ride in the W100K Peleton. It was certainly an honor to line up behind the Warriors and President Bush and clip into our pedals as soon as he said, "let's go!" The ride went straight onto the 45 mile trail system that Bush had custom built for his use. And honestly, these trails were nothing short of top notch. Rough jeep trails, sandy single track, to ridge lines, slick rocks and short, kicker climbs. My favorite part of the ride was a section called The Zipper; a section of dusty, hard packed single track, cut into a straw field in the shape of curves, turns, and generally not-straight lines. It was so twisty-curvy that all 75 of us could be on "the zipper" at the same time and see each other, as we zigged and zagged through the field. I'm pretty sure my inner dialog consisted of a lot of "weeeeeeeee's!!!!!". Like every great ride, there were volunteers and aid stations along the way. We were treated like pros, having to carry just camel backs and being fed and watered along the way. At the conclusion of the ride, we felt awesome. And Bush himself even told Ady and I, "you chicks are good!" Feeling great after Day One! Thursday concluded with a reception/dinner with less dirt and more style. Given assignments for the wedding reception-style seating Ady and I were sure we'd be at some back corner table. Instead, we were shocked when we found our table front and center, and continued to drop our jaws when G.W. dropped his speech notes on OUR table. (Cue the second round of "NO WAY!") It was an amazing evening spent with people that already felt like friends, and concluded with a surprise private mini-concert by Pat Green. Truly, the hospitality in Texas doesn't disappoint. The ride (thankfully) started out on the road, where Ady and I both felt comfortable. We hung out mid pack, but noticed that George and his Warriors were definitely setting a quick pace. We hit a stretch of false flat going uphill and both knew we needed to find a comfortable rhythm if we were going to survive this day. We found a groove and spun our legs out. The peleton spread out a bit but seemed to come back together once we hit the dirt. Again, we settled in the middle of the pack and just rode our ride, enjoying the scenery, the trails, and getting to know the riders along side of us. Today's ride was a bit more technical, but we handled it fine (even though Ady fought a sliding seat post the entire time). The halfway mark came at the perfect time; we refueled just as the front group of Warriors and Bush were taking off after their 5 minute break. 5 minutes back didn't seem so bad after covering 15 miles. We took our time, ate (took a picture with our favorite Bush Center Staffer) and headed out onto the trail. The rest of the day is best told in retrospect, since it would have been helpful to have had the details of what transpired in real time. We were told later in the day that after the halfway mark, the original course was thrown out by Mr. Bush, and he rode his own course for the rest of the day. This caused understandable confusion among the volunteers, which we didn't catch wind of until we were told at one of (what we thought was) the final aid stations that we had about 5 miles to go, only to be told by the next volunteer that we were about half way and had 13 miles left. The following group of volunteers echoed the previous charge's statement. The next stop told us the President was about 3 miles away from finishing for the day, so we allowed ourselves to feel like we were in the home stretch. 10-15 minutes later, the course was taking us back to the helipad.....and a volunteer was now directing us to continue to ride past....and off onto another part of the ranch. Maybe, we thought, they added some road section onto the end to cap off the miles. And since we didn't see the President and Warrior group already enjoying lunch, we still figured we were not too far behind them. We knew were were in trouble when we hit the next fork in the road. The husband/wife volunteer duo, God bless 'em, looked utterly confused. She was trying to explain that the President had come by twice already, heading once out onto the Zipper and the second time out past the tree line. We could even see the group riding along the horizon line but had no idea what section of the trail they were on. Next, there was a rider just off the side of the road saying he was the Sweep. Whhhhhaaaatt? (I'm fairly sure that's what came out of my mouth, too.) How could the sweep have gotten there before us, when we knew there was a slew of riders still coming behind us? At this point, we'd been standing around for too long. We knew the Zipper and knew how to get there. We'd been riding for 3 hours already and just wanted to finish up the day. Less talking, more riding. Off we went.....down past the barn and onto the infamous Zipper. Now one thing about the Zipper - it is a cool trail when you are riding it with 75 of your closest friends. It's a completely different experience at the end of a 30 mile ride, tired, hungry and with only two of you. We rode for 15 minutes, almost in silence...I think trying to will time and distance to pass more quickly. Suddenly, we were in the middle of a field with zero sense of direction. We looked for the tops of the tents set up on the helipad. We looked for the blue shirts of the awesome volunteers or, by chance, the bobbing helmets of other riders. Nothing. So....we kept riding. Another 10 minutes and we stopped again. Again, the horizon was totally flat. My direction skills aren't too shabby and I had NO clue where we were. And neither did Ady. Just then we saw some movement on the horizon.....some of the off-road Gators....picking up people in blue shirts! They were taking the volunteers off the course! Our jaws dropped. We'd only been riding for 20-25 minutes since we saw the last group of volunteers and the ride was already being called? Ady made the wise decision to turn right back around and ride back the way we came. We knew how to get home and it made perfect sense. We could hang on for another 20 minutes. Another 5 minutes into our backtrack, we ran into a group of 3, all wearing the red shirts of support riders. Hooray for not being left out here all by ourselves! The trio assured us they knew how to get back, so we turned BACK around and headed forward on the Zipper. More minutes, more miles.....a little bit more confusion on where exactly we are, and we FINALLY make it to the road. Barely. I'm fairly certain I was at a constant 30-second countdown from an explosive bonk. But thankfully the 5 of us are together, safe, and back in time for.....lunch to be over and the food has all been eaten. There was never a better time to eat at Freebirds! The weather had been great so far. Even the rain had held off until we were sleeping....but when it came down Friday night, it came down HARD. And it was the kind of rain that turned well groomed trails into sloshy mud pits. At breakfast on Saturday, we heard that head mechanic, Pam, was calling for a 12 mile road ride followed by a few miles on the less severe trails. Phew. I had managed to escape without any big falls up to this point and staying off wet roots and slick rocks was right up my alley. Thankfully, our bodies (and legs) had recovered from the big day yesterday, and back at the ranch, we suited up and got ready to finish up the 100K! Team 4Mil, ready to roll! Out on the road, the peleton, 75-strong, stayed at one pace. Ady and I found ourselves riding behind Jeff, and 4 wheels back from President Bush. We made a quick pact to stay in this front group all day. There was no reason we couldn't hang for 18 miles, most of it on road. The energy of the group was high, and you could feel an overall release of stress over the rain, the previous day's ride, any lingering causes for tension. Today, we rode as cyclists; as one group...as one unit. Each of us had overcome some struggle....mental, physical, emotional....and we rode stronger today because of it. We knocked out the first 13 miles on the road much quicker than I expected and dropped onto the ridge trail, the group still intact. And then we hit the mud. It was everywhere - we rode on. We hit the aid station where I think they expected us to only have a few miles left to go. Again, Bush changed the route and we kept adding sections....and we rode on. I did hit one nasty section of mud and my entire bike slid away from me sideways, but thankfully a Secret Service Agent broke my fall. I had time to warn him on the way down ("I'm falling....I'm falling....I'm falling!!!") and he was kind enough to allow me to take him down too. Hey, at least I knew I was safe. As we hit the final stretch taking us back to the helipad for the final time, the Warriors were all ushered to the front to lead the way. We came back to the street lined with the weekend's amazing staff and volunteers, cheering us in. It was a moving, emotional celebration to conclude what is a ride for the books. So much for claiming to be at a loss for words. There are more stories to be told about this weekend, more memories to share and friendships made that will last a lifetime. But this is all I will force you to read right now. I have never been more proud to be part of an organization with such a worthy cause; that operates off of the blood, sweat and tears of its volunteers, and that gets recognized, in a humble way, for the work it does to provide what relief we can to the men and women who give so much (and continue to give every day) for our country and our freedom. I am proud of President Bush and the manner with which he conducts these events. They are not about the press nor about his time in office. This is his way of being able to say "thank you" to those that served underneath him...and after listening to many of their stories, those that would fight for him again if he led them into battle. Politics aside, George W. Bush is a good man...and honest man....who understands that people went to war without questioning his command; and many paid a price. He and Laura graciously opened up their home to us for a few days, and we all shared a hobby that keeps us fit, healthy...and sane. I have friends for life in Jeff and Ady, sharing an experience that we'll talk about for years. Most of all, I'm proud to be an American....and free to ride my bike. I can't think of a better way to spend a Memorial Day Weekend. Thanks for reading.